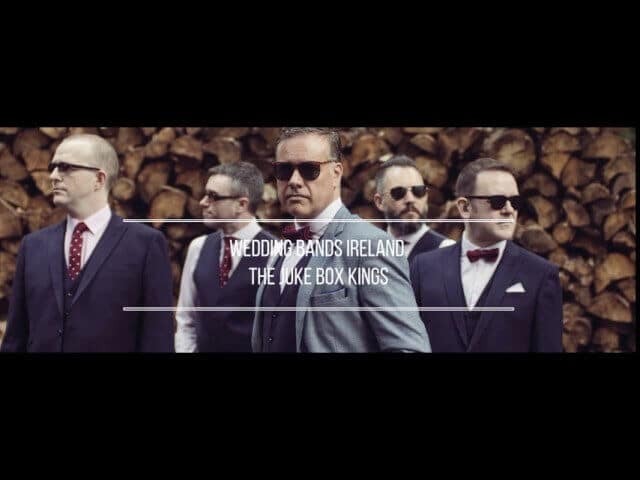 We are Wedding Bands Ireland The Jukebox Kings. A Live Music Wedding Band Dublin based that specialise at playing Live for Exclusive Weddings and Corporate Events. When you have finally decided to exchange Wedding Rings and the Wedding Bells are ringing we would love to be your band of choice to help to turn your celebration into a fantastic party. I’m Derek Lead singer with The Jukebox Kings. I would be delighted to help you with making your choice. Please contact me directly for availability or to answer any questions you may have? Read on to learn more about the Band. Who Are The Jukebox Kings Wedding Band? We are one of the Top Wedding Bands in Ireland . 5 professional musicians who provide unique entertainment. Fantastic Lead and Backing Vocals, complimented by excellent musicians. The Band Line up is Male Vocals, Drums, Bass Guitar, Rhythm / Lead Guitar and Piano/Keyboard. We cover many Musical styles in our set List. We also offer the option to include Brass players either Trumpet, Saxaphone or both. Don’t Just take our word for it read our Reviews. We have worked in the Music business for many years. Together since 2008 we play as The Jukebox Kings Wedding Band. For 10 Years we have maintained our popularity as one of the most in demand Bands in the Wedding Business. Our experience makes us a great choice to provide entertainment for your Wedding Experience. Live Music is a benchmark for every great Wedding. Great Music is a vital ingredient for you to ensure a successful Wedding Celebration. Our Band will cater to every musical taste. We ensure everyone is included on the dance floor. The Jukebox Kings are Ireland’s Best Live Wedding Band, providing Fantastic Party entertainment. Filling Dance Floors is our specialty. on email: [email protected] or by phone: 0857386365. There are many reasons why you should book your Wedding Entertainment with The Jukebox Kings ? The best is because your “Once in a Lifetime” occasion can’t be trusted to Amateurs. Book A Band that really cares about providing the best entertainment experience for You. When you book The Jukebox Kings you are guaranteed that you are securing the services of one of the most respected Irish Wedding Acts. We Provide Professional Wedding Entertainment for your Celebration from start to finish. Our famous live entertainment is followed by a top DJ set. We are regarded as one of the Top Irish Wedding Entertainment in the Country. We consistently deliver Unique Wedding Entertainment to Hundreds of happy couples throughout Ireland. We are 2 time recent Wedding Band of the Year Finalists for 2017/2018 at The Irish Wedding Awards. Nominated one of the Best Wedding Bands Ireland 2018 in the Entertainment category. Wedding Band of The Year Irish Wedding Awards Finalist 2018. 5 Reasons you should Book The Jukebox Kings. We are Band of the Year nominees 2017/2018 through our Wedding Band Association with the Wedding Awards. We provide entertainment for Prestigious Corporate Events. Clients include the I.R.F.U, Show Jumping Ireland, Horse Racing Ireland , The Hermitage Clinic Dublin, Coca-Cola and many others. We Play for up to 3 hours where most Bands may only provide 2 hrs on average. We provide the right music mix for you and your guests, 5 professional musicians and seasoned entertainers who will ensure your celebration is a complete success. Our extensive repertoire includes both Classic and Modern Fantastic Floor Filling Hits. A Full Dance Floor Guaranteed All Night Long. We understand that every couple’s musical tastes differ. There simply is nothing better than a Live Band. We work with you every step of the way to ensure that you get your Perfect Entertainment. Here are some Questions we regularly get asked. Do you play country Music? Yes we do. Although we would not regard ourselves as one of the great many Country Wedding Bands ireland has to offer, we do cover a broad range of Irish country and American Country standards. Why Should I book a live Wedding Band for my Wedding? Live Bands, play and sing live anything else is a mime act. Live Bands can cover all styles of music and can also facilitate singers from your guests if required. Will you learn our First Dance Song? We always prefer to Learn and perform the First Dance Song live whenever possible. We also won’t be offended if you prefer to play the Original version on CD. How many songs do you normally cover at a Wedding? We play on average for around 3 hours with one break so we manage to get through a lot of 3 min songs. Should my fiance and I play oldies music at our wedding? The Jukebox Kings can play oldies, chart songs, country, rock , swing, Disco and every other style you can think of. We suggest a nice balance of everything to suit all of your guests tastes. What are some good Wedding Songs? Well this one is always hard to answer, however over the years we have seen songs come and go out of fashion. Funnily enough the songs regarded as cheese are often the ones that get the best response and have stood the test of time. How can you ensure that our guests have a fun night? We set out every night with the same aim, to have fun and enjoy ourselves, make great music, play great songs and not take ourselves too seriously. This always ensures that guests at a Wedding share the experience, often the stage , sometimes the performance and always the fun. My Fiance is from Australia, America, Canada, India, South Africa, Germany, Holland, Poland……. Can you facilitate music for their family? This one comes up regularly as so many Irish people have found love on foreign shores. Don’t sweat it we have covered multi-cultural wedding on a great many occasions. The secret we found is to ensure we include something for everyone that makes them feel at home and part of the fun. Do you facilitate singers from my family joining the band onstage? The Jukebox Kings will always allow singers to join us onstage only with the expressed permission of the couple in advance. Do you take requests from the Dance Floor? Yes within reason we will play requests from the dance floor so long as the songs are appropriate for the audience and occasion. (No Gangsta rap before 12.am) Once the DJ set kicks in and the Children have gone to bed anything goes. Complete Music Options for your Wedding Day. listen to some music we perform to rock your Party. Booking the Band requires a deposit of 15% and all bookings are confirmed in writing with the balance due on the day of the performance. Deposits can be made by bank transfer or by Paypal. Reduced rates are offered for midweek bookings. A booking for the band will be confirmed once the deposit has been paid. days. The Jukebox Kings host 4 Showcases a Year. One for every Season. The showcase is an opportunity for you to meet the band and to get a feel for the energy that we bring to our performance. We’d highly recommend that you come along. There is no charge to attend and we try to provide as much notice in advance to our registered couples. What should I pay for a Wedding Band in Ireland 2018? Prices of Bands vary just like any other service. There are many styles, sizes, quality and level of professionalism available. This inevitably makes this a difficult question to answer in one sentence. The Question perhaps you should ask is how much am I willing to Pay for my Wedding Band? Working within your own Budget may dictate that you can only secure a certain type of Act. There are acts that perform as a duo ( although I personally think a Band is at least 3 people) using backing tracks to supplement the other instrumentation. Most Bands require at least 3 Instruments to create a reasonable sound. Guitar and or Keyboard, Bass Guitar and Drums. A duo can of course only provide at least 2 of these instruments. However, if you are comfortable with this option then you may secure a great duo at a very affordable price. The Larger the number of Musicians in a Band the more you would expect to pay. If you book a Wedding Band that is local to your Wedding Venue then you might also expect to pay less than a band that has to travel 2-4 hours to your venue. Simply put, expect to pay more for a five piece than a four piece etc. If the wedding Venue is in Killarney and band are travelling from Donegal expect to pay more than if they are based in Kenmare. This is basic and fairly simple economics. These are things that you might also consider when searching for your Wedding Entertainment. Should Price be the only deciding factor when choosing Entertainment? Surely Your Wedding Day requires you to seek out the Best Entertainment you can afford. While I know it’s not likely that your Budget will stretch to Ed Sheeran as Prince Harry and Meghan Markle can. At the Very least your Wedding Band should perform very reasonable covers of great acts. The Value of a great Wedding Band will be enjoyed long after the honeymoon hangover is worn off. The Price of the Band likely reflects the demand and quality of the Act. Great Bands are true professionals and have worked at their craft usually for very many years to reach the top of their profession. What Should I Pay for my Band? Prices can range from as little as €499 to €3,000 and beyond. A recent Weddings Online Survey suggests that the average price couples paid for Bands for their wedding in 2017 was €1,961 (see Weddings Online Infographic) This will, of course, take in to account the highs and the lows of the market. The average price quoted seems a fair reflection of the cost charged. I would suggest that any Quality Wedding Band should be somewhere in this Ballpark price range between €1,800 and €2,500. This might seem like quite a hefty fee to pay for one night’s entertainment. But when you consider its divided between the Band and the costs that need to be paid for travel and expenses such as insurance and advertising. Each musician has to travel to and from the venue perhaps for many hours each way at unsociable hours. Very often the day can be 12 hours long or more especially if the Band perform at the ceremony through to the Reception. Its amazing the number of Brides who I have spoken to at 4 am who found it incredulous that I was about to set off on a 3-4 hour drive home following a long days entertainment. Free consultation by a recognised and experienced Wedding Professional available by phone/ Skype or in person prior to booking. Ongoing and continued advice and communication available throughout the lead up to your event. Simple and Secured Online Booking process Guaranteed by PayPal. Book our Professional DJ trained by Today FM for seamless entertainment following The Jukebox Kings live set. We can guarantee no overlap or repeated songs and we can tailor your set as requested. Background Piano and Guitar, playing sophisticated tunes and favourites to entertain your guests while also allowing the conversation to flow. We can provide a Male Tenor or Female Soprano and accompanist for your Ceremony. Let us take care of all of your musical arrangements with your celebrant. We can ensure the appropriateness of the musical choice.